We report here that the ventilator of the Fabius_R GS premium anesthesia workstation (Dräger Medical Inc., Lübeck, Germany) worked adequately with a defective Drägersobe_R CLIC 800+ Disposable Absorber (Dräger Medical), which was replaced during surgery. The Fabius_R GS premium anesthesia workstation passed the built-in automated checkout. The patient was scheduled for gynecological laparoscopic surgery. General anesthesia was administered with no difficulty and was maintained with air, oxygen, and sevoflurane. Total fresh gas flow was 4 l/min with 1.5% sevoflurane. The gas analyzer at the Y-piece showed that FiO2 was 38%, and the inspired and expired concentrations of sevoflurane were 1.4% and 1.1 %, respectively. The ventilator setting was in pressure-controlled mode. Because of an elevation of inspired carbon dioxide fraction during surgery, we replaced the device with another Drägersobe_R CLIC 800+ Disposable Absorber with the ventilator. The disposable absorber was replaced, but a decrease in FiO2 to 34% was noted subsequently; the inspired and expired sevoflurane concentrations were decreased to 1.1% and 1.0%, respectively; a slight increase in the bispectral index score was observed; and a slight smell was noted, which was suspected to be the inhaled anesthetic. A leak from the absorber was inferred. However, no obvious change was noticed in the performance of the ventilator, including tidal volume and end-tidal carbon dioxide level, and no alarm rang. We turned up the vaporizer dial but did not inspect the absorber. Sevoflurane administration was terminated after surgery, the patient’s spontaneous breathing resumed, and the ventilator was switched to manual ventilation mode. We noticed that the breathing bag had collapsed, and sufficient fresh gas was not delivered from the inspiratory port of the breathing system in spite of increasing the total fresh gas flow and oxygen flush. The patient’s tracheal tube was disconnected from the anesthesia circuit. An external oxygen supply and a manual ventilation bag were promptly obtained, and oxygen was supplied to the patient. Extubation was performed after spontaneous breathing was fully restored. No hazardous effects were observed. A later inspection of the absorber revealed a defect of approximately 2 cm in diameter at the edge of the attachment lid (Figure 1). Figure 1: The defective CLIC absorber. A) The canister in place on the machine. The black arrow points to the defect. B) A close-up of the hole. The Fabius_R GS premium anesthesia workstation has a piston-type ventilator and a fresh gas decoupling (FGD) valve, which is located between the fresh gas inlet and the ventilator circuit1 (Figure 2). The carbon dioxide absorber with the CLIC adapter, which is designed to enable the canister to be exchanged during surgery2, is located between the fresh gas inlet and the breathing bag. During the inspiratory phase of mechanical ventilation, the FGD valve shuts off fresh gas flow to the ventilator, and part of the excess gas moves to the breathing bag through the absorber. During the expiratory phase, the FGD valve opens and the piston-type ventilator creates slight negative pressure to allow fresh gas and gas contained in the breathing bag to refill the ventilator.3 In our case, the anesthesia machine with the defective disposable absorber operated adequately except for the changes in FiO2 and inspired and expired concentrations of the inhaled anesthetic. We considered that the FGD valve spared the anesthesia circuit on the patient side from the leakage site on the absorber during the inspiration phase of mechanical ventilation; thus, a low pressure alarm did not sound. 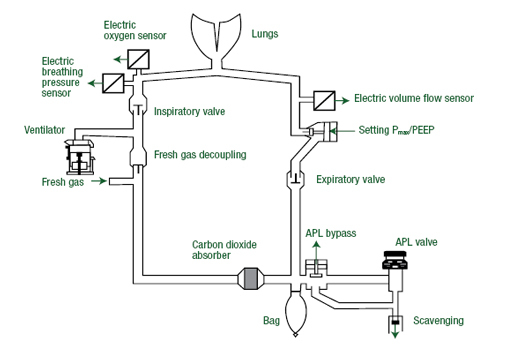 During the expiratory phase, ambient air was drawn from the hole in the defective absorber into the anesthesia circuit; therefore, a low fresh gas alarm did not sound. Figure 2: Gas flow diagram. Fabius_R GS premium anesthesia workstation. Modified from an original figure, according to the Instructions for Use: Fabius_R GS premium Anesthesia Workstation Software 3.n.2. Information furnished courtesy of Dräger Medical Inc. APL, adjustable pressure limitation; PEEP, positive end-expiratory pressure; Pmax, pressure limitation in volume mode. A system leak test with the defective CLIC absorber was performed later, but the built-in system leak test could not be started, because the internal pressure in the circuit with closing of the Y-piece was not raised to the required level. A trial operation of the ventilator with the defective absorber revealed that positive pressure ventilation could be provided ith breathing bag collapsed due to entrainment of room air through the hole in the canister. The defect in the canister may be detected during visual inspection and during a leak test of the breathing circuit. As stated in a previous report,4 any part of an anesthesia machine and circuit that passes a leak check should not be replaced. The Fabius_R GS and the other Dräger anesthesia machines with the CLIC system allow replacement of the disposable absorber without interrupting the ventilation and the anesthesia delivery. The disadvantage of the CLIC absorber when a leaking absorbent canister is exchanged for an exhausted non-leaking canister during surgery has been presented.2 In our case, the aspects indicating the defect in the absorber were decreased FiO2, decreased inhaled anesthetic concentration, the smell of the inhaled anesthetic, and the collapsed breathing bag, which were derived from entrainment of room air and leaking exhaled gas. Neither visible nor audible alarms were activated. If these signs are missed, a hazardous situation may result during spontaneous ventilation, depending upon the resistance of the hole in the canister. In an adult the inspiratory flow rate may be as great as 15 liters/minute, which cannot be satisfied by only the fresh gas inflow. The remaining inspired gas must then come from either the hole in the CLIC absorber (entraining room air) or the breathing bag if it is distended resulting from a small leak in the absorber. If the hole in the canister creates a large leak, spontaneous ventilation cannot be assisted by squeezing the breathing bag. The visual check of the replacement canister is essential since a leak test cannot be performed during surgery. Future design changes should incorporate some methodology for alarming or alerting the clinician of a leak in the CLIC canister. Department of Anesthesiology, Department of Clinical Engineering, Saiseikai Matsusaka General Hospital. Dräger Medical, Inc.: Instructions for use: Fabius_R GS premium anesthesia workstation software 3.n. Edition: 7; 2009-10: p.212. Dear SIRS: Dräger Fabius leak test questioned. APSF Newsletter 2009;24:52-53. Miller RD, ed. Miller’s Anesthesia. 7th Ed. Philadelphia: Churchill Livingstone Elsevier, 2010, pp. 703-4. Feldman JM: In Reply. Anesthesiology 2004; 100: 756.